We always like to supply bolts for unusual projects, and the Smolen-Gulf Bridge is no exception. 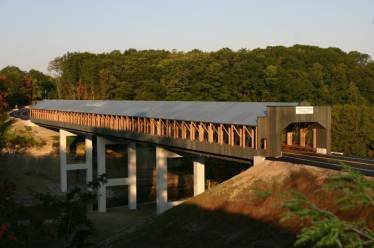 In August of 2006, construction began on a covered bridge to replace an existing steel bridge over the Ashtabula River in northern Ashtabula County. When completed, the bridge’s total length of 613 feet easily eclipsed the previous record length of 449 feet, making it the longest covered bridge in the United States. The contractor working on the job contacted us in June of 2007 and asked us to supply bolts and tie rods for the project. We were able to manufacture and ship over 4,000 large heavy hex bolts, 2,300 lag bolts, and 1,600 tie rods within a month. All product was galvanized and the tie rods were shipped assembled to the job site over 2,000 miles away.